The average clergyman is not expected to extract a horses’ tooth. But then, Anglican Archdeacon Charles H.R. Bradshaw was anything but an average clergyman. As rector of the North Thompson Mission, headquartered in Kamloops, B.C., he served the largest area under one clergyman in the Canadian Church, excepting the Arctic and North West Territories. Once a month he held Sunday service in St. George’s church in North Kamloops. For ten to twelve days each month he was away from home up the North Thompson River, holding services every day. The Thompson River Mission had few churches. ‘There were from nineteen to twenty-three points at which services were held. Some regularly and some from time to time as circumstances dictated,’ says a summary of his work. Though the family had two cars, traveling to the far reaches of the Mission wasn’t a simple matter of driving. What roads existed were narrow, dirt corridors. Past Birch Island there simply were no passable roads. Accessing points beyond to Valemount, the northern extremity, meant taking a C.N.R train. Not just the passenger train, either. That might suffice to reach division points such as Blue River, but it wouldn’t stop at scattered groups of houses. For them he had to take the way-freight. The way-freight, was, just as it sounds, a smaller, slower train, carrying goods, mail and passengers along the North Thompson. Like all trains then, it was pulled by a coal-burning steam engine. Water towers stood alongside each small station. The passenger car of the way-freight was heated by a round wood-burning stove. Nor, when he arrived at his destination, were his difficulties over. Services might be held in a school, hall, if the town boasted one, or private home. Mr. Bradshaw depended upon members of his congregation for food, lodging and transportation, which could be variable. a misunderstanding, we thought he’d be going elsewhere. We’d had lunch and were just clearing up when someone called out that Mr. Bradshaw was walking down the path. Our mother called a hasty meeting. We were informed that we were going to eat lunch again, just as soon as she made something, and punishment would be swift and certain for any child who uttered one word about having to eat it twice. We heeded her words. Though he was an Anglican priest, congregations in those rugged, rural areas were made up of people from many faiths. Few ministers had the gumption to travel as he did. Consequently fine points of doctrine which might have seemed critical in Toronto or Edinburgh became inconsequential blurs in Albreda. The announcement “Mr. Bradshaw will be holding church in the school on Saturday” elicited murmurs of “Well, we’re all Christians!” and a large attendance of loggers, farmers, railway-workers and store-keepers with their families. 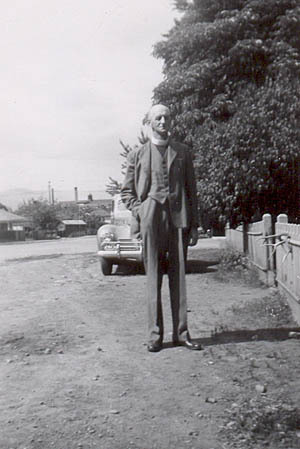 As a traveling rural minister, Mr. Bradshaw was far more important in the lives of all types of people than an urban minister with a regular parish could be. 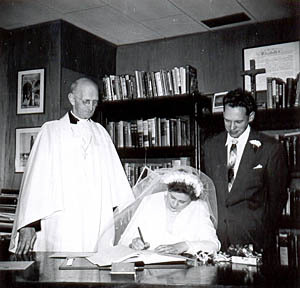 What was more important: that a couple be married in the Presbyterian Church or that they be married? “We’ll have the wedding when Mr. Bradshaw comes next,” was the decision. The same attitude prevailed regarding baptism. Which is how my two brothers and I, born to a Lutheran mother and United Church father, were baptized into the Anglican Church. Not during a regular service in the school either, but at our own home, on a sunny June day, outdoors next to a fragrant wild rose. Mr. Bradshaw was an influential person in the history of the North Thompson. I’m indebted to Dorothy, his daughter, for the story of his life elsewhere, with his family and his other parishioners. Of course, the actual story began far away from Kamloops, and Canada. Facts from a synopsis of his life: ‘Born in Sussex, England to William G. and Dora (Studd) Bradshaw on April 15, 1901. After attending Eton Public School, Charles read law at Trinity College, Cambridge. He served with the Coldstream Guards at the end of W.W.I. Later he felt the call to Missionary work and came to Canada in March 1923 to serve in the Tisdale district of Sask. In the fall he entered Emmanuel Theological College in Saskatoon, graduating in 1925. Margaret Cicely Reynolds came from Southport, Lancashire in the summer of 1923 to work on one of the Canadian Sunday School Mission vans. They were married in St. Albans Church, Prince Albert, on Dec. 2l, 1923. Charles’s first parish was Maymont, Sask. ….In 1928 they returned to England where Charles was assistant to the Vicar of Old Woking, Surrey. But their hearts were in Canada, so they returned, in 1934, this time to the Diocese of Cariboo, in Kamloops. B.C. Sometimes a straight face was the most important attribute a minister could have. Not only was Archdeacon Bradshaw’s pastoral area one of the largest in Canada; it included people of many backgrounds, First Nations, Chinese, Japanese, and European. He treated all of them respectfully, feeling that he could learn from them, and he tried to help wherever he could. Which brings us to that horse. He had horses of his own in England, and he’d lived on farms in Canada. Nevertheless, Dorothy was surprised to discover just how knowledgeable he was about them. It happened when, as a seven year old, she went with him on a trip to Birch Island. As they passed through Little Fort, they were hailed by a teenager waiting by the side of the road. “Mr. Gainer wants to see you. One of the horses has a bad tooth.”, he explained. Off they went to the Gainers. While Dorothy went to the house to have tea with Mrs. Gainer, her father took out a little kit, like a first aid kit, and went off to the barn. There, using the kit, and a good deal of horse sense, he pulled the horse’s tooth. That kit always had a place in the car. He had unexpected medical skills with people, too. A friend, born in Blue River, prematurely, with the aid of a local mid-wife, tells of Mr. Bradshaw giving advice which helped both her and her inexperienced parents get some rest, as she screamed and screamed. He always visited her parents, the local teachers, on his pastoral rounds. After hearing the shrill shrieks he said he’d noticed that among the natives, often, if they gave the babies sugar, it quieted them down. “Dad started dumping sugar into my formula and it did the trick.” It’s been handed down in the family lore. Today, as Dorothy remembers, “Dad always enjoyed the country life much more than life in the city.” A good thing, too, because there were so many small country places for him to preach; Barnhartvale, Brigade Lake, Savona, Heffley Creek. He took an interest in all the agricultural pursuits. During one month when the entire family was quarantined because one sister had diphtheria, they would go for long drives into the country. Mr. Bradshaw would comment, “That person’s got a good crop this year.” Or he’d stop and talk to the horses which would all go over to him. During harvest and Thanksgiving he’d come back with the car full of vegetables and fruit. During the war years, when there was rationing and people had limited amounts of money, they’d also give coupons they didn’t use. This went to the Church for the needy. Serving the congregation meant more than just preaching. Mr. Bradshaw helped one parishioner paint the church, and he helped build the Little Fort Church. It was never a nine to five job. One dark December he’d just arrived home from a trip up the North Thompson. It was about five o’clock, when the phone rang. Two children of a family in Clearwater had drowned in the river. They were playing and went through the ice. He immediately replied that he would come. When it was suggested that he’d just made a long, cold drive, his response was simple, “They need me.” A cup of tea and a sandwich for the road and he was on his way to comfort the grieving family. One Christmas Eve there was no one else to take the service at Ashcroft. He and his family drove down there. Coming home the heater in the car quit. They were almost frozen by the time they all got home. Driving was always a little chancy. Dorothy was with him and they were coming home from another trip up the North Thompson when the car got a hole in the gas tank. It was already night. They parked the car and walked down a long dark road to the nearest house. Those people had already gone to bed. They had to walk to another house to call Kamloops for rescue. Mr. Schrieffles, a local car dealer, brought a mechanic out to help them. After some complicated repairs, the two cars headed slowly back to Kamloops. Dorothy worried when her father was away on his parish duties. Certainly something could go wrong with the car. Mostly, though, she worried that the Germans or the giants might get him. During the Second World War there were many German settlers up the North Thompson. No matter how often Mr. Bradshaw assured her that they were kind people who meant no harm, she wasn’t certain that they weren’t like the bad ones Canada was fighting overseas. The Archdeacon must have been inured to eccentricity among his flock. However, hearing Dorothy’s account of her fears, I did wonder what he made of our family many years later. We had no car, nor, in Valemount, did he. We were walking up town with our mother when, (who knows why? ), we began to talk about the goose-step, and how difficult it must be to do. We thought we’d try. There we were, a caring, affectionate mother and her four children, goose-stepping along in formation, when we rounded a corner to find Mr. Bradshaw striding towards us. Sometimes, there’s just nothing to say. And the giants? Well, all along the North Thompson there were stories of large, threatening fur-covered creatures, which were a lot like humans. Dorothy was always so glad when her father came safely home. Although he didn’t have much time at home, he was a fairly domesticated fellow when he was there. He not only mowed the lawn and painted the fence, but, unlike many men of his era, h e did the laundry, with the wringer washer, and followed up with the ironing. Mrs. Bradshaw was very active in her husband’s ministry according to reports. ‘When he was away she often arranged for lay readers or retired clergy to take the services at St. George’s, often providing their transportation to and from services.’ People were always coming and going from their home, Dorothy remembers, particularly at Christmas. After the morning service the family brought home people from Church who were on their own. Their mother always arranged for small gifts for them. The family gifts would be opened in the early afternoon. More people came for Christmas dinner. 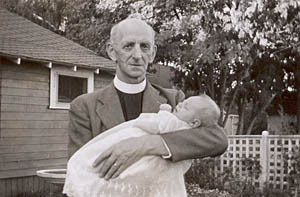 When Archdeacon Bradshaw retired in 1959, it was said that it took five people to replace him, over a period of two years. During his time in the Diocese of Cariboo he’d been Administrator of t he Diocese and Rector of St. George’s. 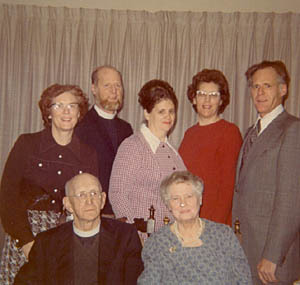 For many years he was also Secretary-Treasurer of the Diocese and he was appointed the first Archdeacon of the Cariboo. His doctors said his health would not permit him to accept nomination for Bishop. Upon his retirement he was made Archdeacon Emeritus. Even in retirement, he continued to assist in several parishes.